Please Note: The Team Logo Is Embroidered On Left Chest - Made To Order - will bill and ship appx. 10 business days from order date. The Definitive Source And History Of The Hawaiian Aloha Shirt - All new edition! got aloha? Tote Bag - FREE - Included with any order! Reyn Spooner Hawaiian shirts from the originators of Aloha Friday. 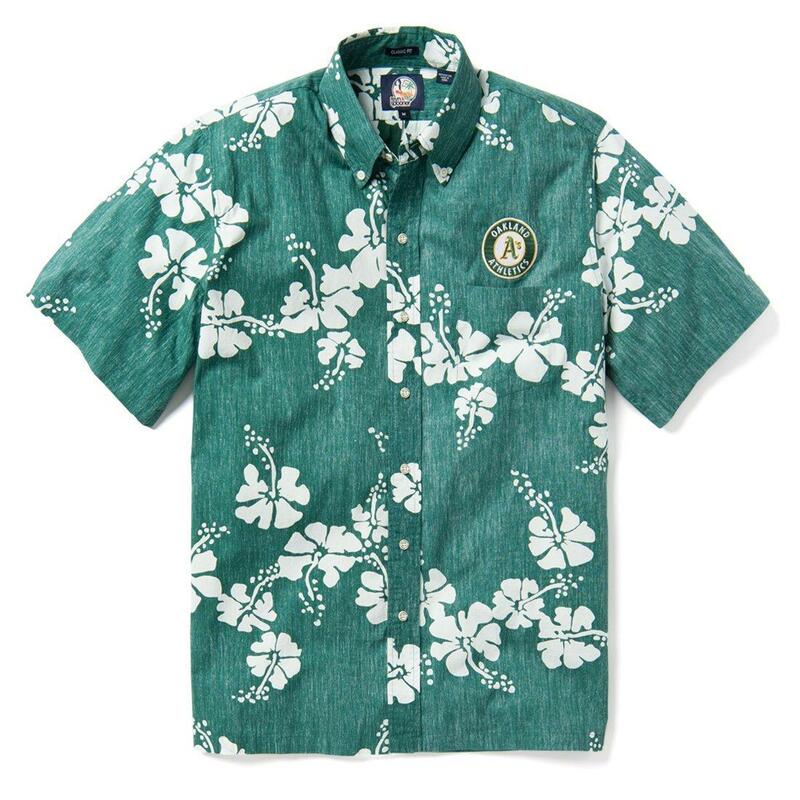 The Hawaiian shirt born on the shores of Waikiki in 1956, Reyn Spooner symbolizes the warmth and spirit of the word "Aloha". A little something about Spooner Kloth which is the majority of the shirts we carry from Reyn Spooner. Spooner Kloth is one of the best investments you can make. Introduced by Reyn Spooner® in 1964, this traditional classic has become the oxford cloth of the islands. Combining the cool comfort of combed cotton with the wrinkle free properties of spun polyester, Spooner Kloth™ is guaranteed to give years of wash n wear durability. Due to its unique nature, the slight irregularities in weaving and subtle variations in color that occasionally occur are natural characteristics of this woven fabric. Spooner Kloth™ fabric will continue to develop its personality and improve with age. Reyn Spooner has earned the reputation of producing some of the finest quality shirts in the Hawaiian Islands. It all started in 1956, with Spooner’s of Waikiki making custom aloha shirts & swim wear. Reyn Spooner garments are tailored with meticulous, uncompromising attention to detail. Reyn Spooner's premium quality fabrics are designed with the customer's needs in mind, from durable and easy-care Spooner Kloth to cool cottons and some special blend resort fabrics. As always, the key uniqueness of Reyn Spooner comes from their exclusive print designs. Inspired by tropical & casual lifestyle, the designs are conceived almost daily, with an eye towards authenticity and fun. Reyn Spooner is never shy to fully express the things that they enjoy in life. As a commitment to the exclusivity of the designs, most of the garments are made in limited quantities, making many a collectible to cherish. Make Reyn Spooner a part of your own tradition. Whether worn daily as comfortable business attire or during casual times, we invite you to the try the Reyn Spooner lifestyle.